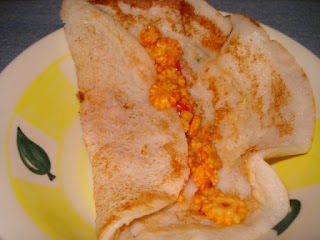 Cooking 4 all Seasons: Baby Corn Masala Dosa ~ 101 Dosa Variety! Ok, I love dosa! I can eat one all three times, any time and all times. Well that should make it quite clear that I am dosa fanatic. So here's an attempt to create and try many Dosa Varieties as possible. Varieties can also mean the combinations that work out good with dosa. So to make things work out easy for myself, I will refer to the gravies or side dishes that go well with dosa! How is that for a start! Amma has a different proportions for different types. So will plan to get all the details from her and update the post as and when I get to work on this series. I am going to call this 101 Dosa Varieties and combis. How is that for a name. Recently I happen to read an article which featured on a Catering school that came out with 1000 varieties, if I am not wrong. So that proves this can be done. Other dosa varieties that I have blogged are Goduma Dosa ~ Chapdosa, Erra Karam Masala Dosa, Pesarattu, Adai. Sides dishes that go well with Dosa are Carrot Kurma, Pithiki Pappu Kura ~ Hyacinth Bean Curry, Cluster Beans Curry ~ Mattikayala Kura. Of course, sambar is an evergreen combi. Today's is about Baby corn Dosa. First time when Amma made this, I just loved it. But we never got around preparing it for various reasons. When I went for Veggie shopping, I just couldn't pass this on. So got a bunch and didn't think about it for a while. Everyday Athamma would ask when I would give those poor Baby corns some moksham. Finally I said today is the day for its salvation! Thus originated Baby Corn Masala Dosa for us to relish once again. Chop Onion and tomatoes to fine pieces. Remove the husk and cut baby corns into rings of 1 " size. Heat a pan with Oil. Sauté Onions, once they are brown, add tomatoes along with salt, chilli and coriander powder. Cook well so that it becomes dry. Add baby corn pieces and cover and cook for 5 mins. make sure the baby corns are well coated with masala. Heat a tawa. Once its hot, spread with oil. Pour one ladleful of dosa batter. Add oil, turn around and then cook for 1 min. Turn it once again and place a spoon of Baby corn Masala and pack like a napkin. You can make this two ways. Either place the Masala on the top side and turn around. This way there are chance for the masala to get stuck to the tawa. Second, once both sides are cooked, place masala in the middle and fold it, covering the masala and let it cook for 1 min. Either way it tastes yummy. Serve hot Baby Corn Masala Dosa with Coconut Chutney or just like that. Ok, here's what I want from you all. Let me know the different varieties that can fall into this 101 Dosa Varieties. I want to cover all the different versions or things that can be done to a Dosa!